Mediterranean Quinoa Salad with Arugula, Avocado and Lemon Oregano Olive oil dressing. 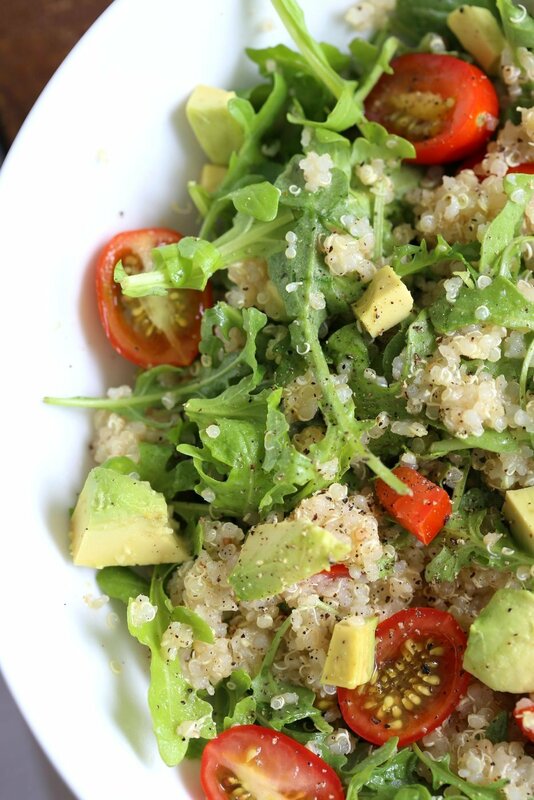 Lemon Garlic Dressing brightens up this Summery Quinoa Salad. Perfect to make ahead and serve at Picnics. Vegan Gluten-free, Nut-free Soy-free Recipe. This Salad hits all the Summery notes. 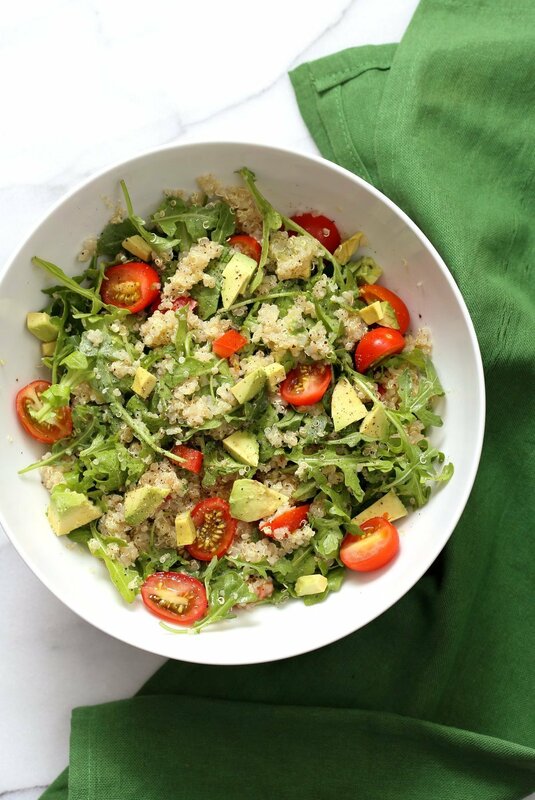 Crisp Arugula, juicy Cherry tomatoes, Avocado, fluffy Quinoa all dressed in a refreshing Lemon Garlic olive oil dressing. Simple ingredients, incredible together. The salad comes together quickly and also stays crisp for upto 4 days. For longer life, keep the dressing separate. Add other ingredients such as chickpeas or toasted nuts to make into a meal, cucumber, zucchini, other greems for variation. The Dressing is inspired by the dressing on the salads and sandwiches I have eaten over the years at Mediterranean joints. I also use it on my Avocado Pear Bagel. Its perfect on many veggies and fruits. Make this Salad your own! Let me know how it turned out. 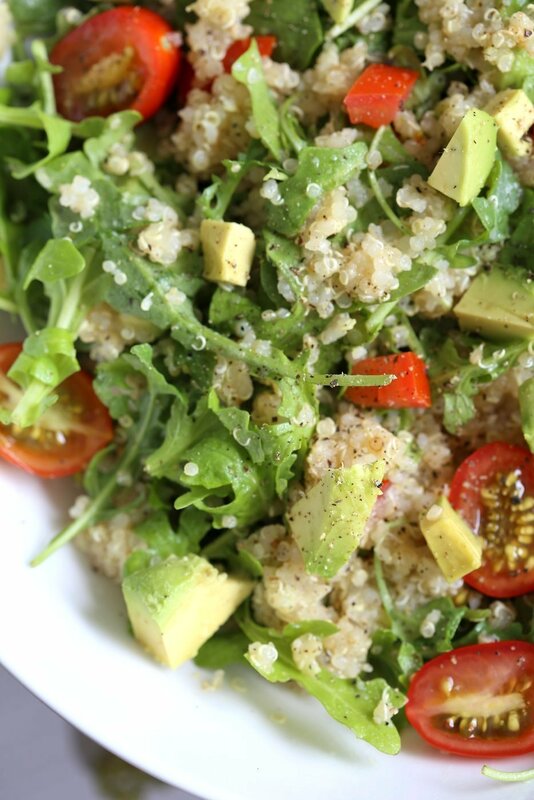 Mediterranean Quinoa Salad with Arugula, Avocado and Lemon Oregano Olive oil dressing. The Mediterranean Lemon Garlic Dressing brightens up this Summery Quinoa Salad. Perfect to make ahead and serve at Picnics. Vegan Gluten-free, Nut-free Soy-free Recipe. Make the dressing by mixing everything vigorously. in a bowl and set aside. Cook the quinoa: Rinse the 1/2 cup quinoa really well then combine in a saucepan with 1 1/4 cup of water, 1/4 tsp salt and 1/4 tsp dried oregano. Bring to a boil over medium heat. Once boiling, lower the heat to low, cover and cook for 13 to 15 mins. Let it sit covered for another 5 mins, then fluff and use. To make ahead: Keep the dressing separate, toss when ready to serve. We added some chickpeas and made this into a Summer Meal. The Dressing is amazing! Many Thanks for the wonderful recipes. I am seriously considering going vegan..although at present am total vegetarian no eggs etc. i do have dairy products and would like to give these up as well. There are not many places here in Centurion, South Africa that sell vegan products. at least I don’t know of them yet. Any advise about how to go about it will be most highly appreciated. I love cheese and paneer etc.. how do we substitute them, is there a certain brand I should be looking out for? For other things such as paneer, you can substitute firm tofu or make your own. i have an almond based paneer recipe in my first book. sometimes i also use kite hill brand original almond cheese as a substitute. Hope this helps! So, we have 5 musicians staying with us, and I made this said last night for the group. I added kalamata olives and fresh orange mint and oregano from my herb garden. I made the dressing 3 hours early and left the dressing in the fridge to meld the flavors. I used red quinoa. 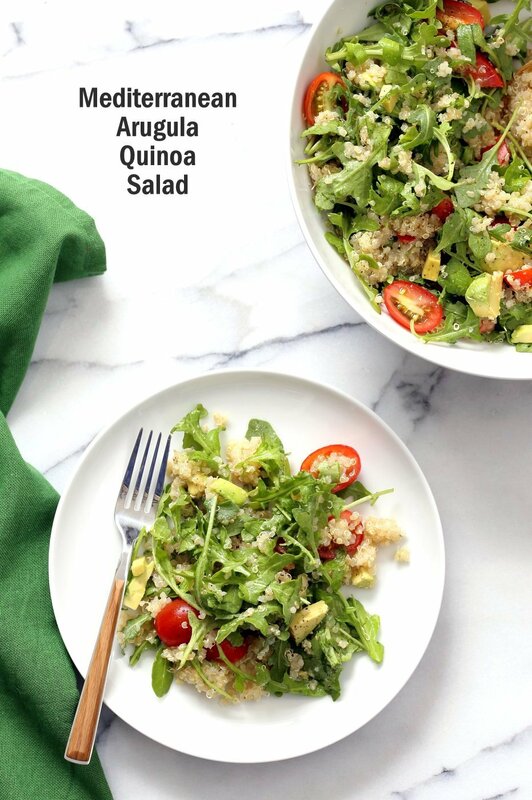 The arugula is essential, over regular greens, in my mind because it provides that nice bite alongside the quinoa. I think this dish would be wonderful with chickpeas. I also served this with asiago artisan bread. We are not vegan, but I make many vegan meals and am moving more and more in that direction. Thats amazing! Yes, i love Arugula in this, but many people dont 🙂 With chickpeas, double the dressing and use more of it so the chickpeas can pick up some flavor. I usually spice up the chickpeas with my shawarma spice blend. I made this Tuesday night. Topped it with some toasted pine nuts. Delicious, fast and easy for a great week night meal! We love your recipes Richa! I have made this dish twice now, and it is delicious – especially good for dinner on hot summer nights!